I frequently describe that my teaching background vaccinated me into teaching as a team sport. My student teaching and early years in teaching were all team focused. I began student teaching in a laboratory school that had me work in a classroom with a master teacher and student teachers and graduate assistants and visiting professors. I then spent time teaching fifth and sixth grade on a team of four teachers with 120 learners in a large room. After five years, I transferred to teach first grade, teamed with an experienced primary teacher, a student teacher and a paraprofessional and belonged to a K-2 team of 7 teachers. I believed I’d find a different experience in middle schools as they are built around teams. But as an example, I meet four sixth grade teachers: math, science, English, and social studies who shared a group of students and discovered that they’d been teaming for three years and had never seen each other teach. At an elementary school, I joined five second grade teachers as they were walking down the hall to the second -grade team meeting. To my surprise, all of them were complaining about having to go to the meeting. I said, “Ladies, why are you complaining?” They said, “We have too much work to do.” I said, “Well, what are you going to do at the meeting?” They suggested they didn’t do any work. That kind of surprised me and caused me to ponder. I understood from my background and experiences that being on a team can be inconvenient. Because I’m on a team, I may have to stay after school at 3:30 and do my planning as that’s when my team members are available. But, it meant when I went home at night, I didn’t have to take my planning home with me. When I was teaming with Diane in first grade and parent conferences were coming up, it meant you spent Saturday at Diane’s house and Sunday at Steve’s house because you couldn’t stay home by yourself and write them. Sitting in that second grade team meeting wondering what “we don’t do any work” meant, it struck me that I wasn’t at a team meeting, I was at a second grade franchise meeting. Each of those teachers owned a second grade and once a week they met and exchanged tips and strategies and then went back and ran their own second grade. That’s really the way a fast food franchise works. You might go to a franchise meeting, but you then go back and run your own store. If those second grade teachers were truly on a team and there’s five teachers and 20 students in each of their classrooms, it would mean then that each of those teachers was responsible for the learning outcomes of 100 students. When they met and had that time together, they would be sharing the responsibility of figuring out how each of those students could be successful. When you hear teachers complaining about having to go to a team meeting, (“This is my time. I should be doing my work”), it often indicates that person is working from an individualized mindset; a singular responsibility for the success of the students that are in her classrooms. At some of those meetings, you’ll hear teachers do what I call sharing. If you mention a difficulty a student in your class is having, your team members may share ideas.You don’t have any responsibility for using any of their ideas. You have no responsibility for reporting back to them on what you did and what the outcome was. That sharing is a good thing, but it’s a far step from teaming. At the franchise stage, teachers begin to plan things together, but they implement them separately. They might design a common assessment but they’re not looking at instructional plans or the results of those assessments. 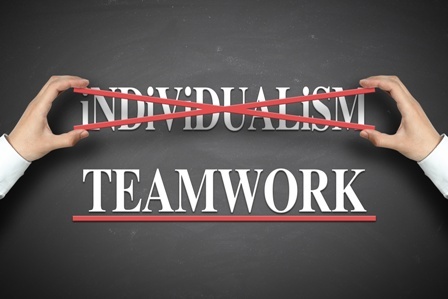 Teachers make the first steps towards teaming when they begin to modify one of their individual behaviors to align with the rest of their team because they believe it’s best for kids. A freshman teacher teaches a note-taking strategy that’s not the one she personally would have chosen but is the one the team has decided upon. She believes it’s better for students to be reinforced by everyone working with that same strategy or process. That’s a step toward teaming. True teaming emerges as each member accepts shared responsibility for all student learning outcomes. Elementary teachers who are going to grade level meetings are a team if all the teachers are assuming responsible for the success of all students in those classrooms. Middle school teachers are a team if the English teacher accepts responsibility for students’ success in their math course. A high school department is a team when the chemistry teacher believes that she is responsible for students being successful in biology.That science team uses time to focus on all students’ success. As you look at the way your school is now operating, how many people are functioning as individuals? Where do you have groups beginning to function as franchises? Do you have some teachers beginning to function as a team with shared responsibility? I believe it is the task of school leaders, administrative and teacher, to continually move the staff further and further along the continuum to becoming effective teams. Functioning as teams, you’re creating the greatest opportunity for student learning success.